While Pundyk paints portraits from photographs and Krieger landscapes en plein air, their actual process of painting, responding to the prior gestures and phrases in any given painting, has something in common. Both artists aim not to reproduce their subjects, but to evoke the essence, the semblance of a place, its light, air and energy. Much of Rachelle Krieger's recent series was painted and completed en plein air at Sands Point Preserve near her home in Port Washington, NY. At times, the weather was so inclement that she had to tie the canvases to the easel to prevent them from blowing away. Favoring loose, bold brushwork, Krieger captures the essence of a landscape through a reductive process that reveals the structural essence of trees, rocks and other natural elements in her surroundings. This method results in near abstractions of particular places. Krieger's rich palette, textured surfaces and raw, stormy brushwork evoke the paintings of Chaim Soutine, Amedeo Modigliani and abstract expressionist Willem de Kooning. 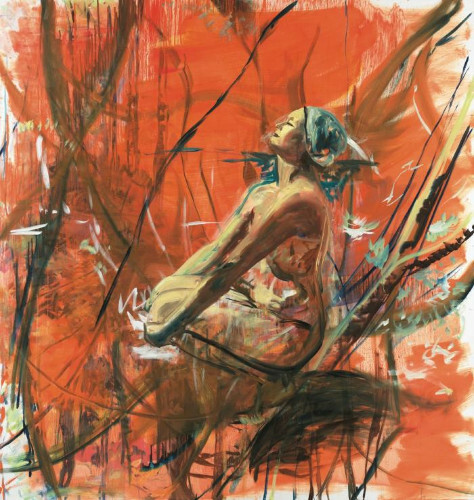 Anne Sherwood Pundyk's new body of paintings features large-scale female figures engaged in deliberate physical acts-shooting, crouching or riding. Sourced from various photographs, these women have been reborn as modern day cousins of their former selves. They rule the abstracted landscapes in which Pundyk sets them, yet retain a marvelous anonymity in their faceless, sometimes headless croppings. "This work allows me to pinpoint my ruminations and translate them with paint into a new cast of characters," she says. Like Krieger, Pundyk approaches a canvas with an assertive and expressive stroke. Whereas Krieger builds up paint to draw out imagery, Pundyk deliberately leaves blank areas of the canvas, allowing a release valve for the heightened emotions the characters elicit.